Taking advantage of an unmotivated, jet-lagged team, Fernando Valenzuela pitched a no-hitter against the Cardinals. It was the second no-hitter pitched in the major leagues that night and the first versus the Cardinals in 12 years. 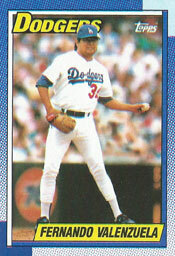 On June 29, 1990, Valenzuela pitched the only no-hitter of his career in a 6-0 Dodgers victory over the Cardinals at Los Angeles. Earlier that night, Dave Stewart, Valenzuela’s former Dodgers teammate, pitched a no-hitter for manager Tony La Russa’s Athletics against the Blue Jays. It was the first time no-hitters had been pitched in both the American League and National League on the same day. Valenzuela, 29, struck out seven and walked three. The Cardinals also had a runner reach on an error. The Dodgers’ left-hander pitched the first no-hitter against the Cardinals since Tom Seaver of the Reds on June 16, 1978. Since Valenzuela’s gem, the only no-hitter pitched against the Cardinals was by Johan Santana of the Mets on June 1, 2012. Eight no-hitters have been pitched against the Cardinals. After beating the Pirates in a night game at St. Louis on June 28, the Cardinals stayed overnight at home and left the morning of June 29 for that night’s game against the Dodgers. The Cardinals arrived in Los Angeles about 12:30 in the afternoon Pacific Coast time. Valenzuela turned to his teammates and said, “You’ve seen one on TV. Now come watch one live,” Rick Hummel of the St. Louis Post-Dispatch reported. Valenzuela’s previous big-league best had been a two-hitter. In the ninth, Vince Coleman led off for the Cardinals. The speedster was the batter Valenzuela feared most in the St. Louis lineup. “Coleman makes a lot of contact and he can bunt,” Valenzuela said. Coleman hit a shot down the third-base line, but it was foul. With the count 2-and-2, Coleman faked a bunt attempt and was called out on strikes by umpire Jerry Layne. Willie McGee was up next and he walked. That brought to the plate Pedro Guerrero, who had been Valenzuela’s Dodgers teammate from 1980-88. Guerrero was playing on his 34th birthday. Guerrero hit a groundball up the middle. As Valenzuela reached for the ball, it tipped his glove and was deflected to second baseman Juan Samuel, who stepped on second for the force on McGee and threw to first for the game-ending double play. The loss was the fifth in six games for the Cardinals, dropping their record to 30-44. “We’re pathetic,” said Cardinals manager Whitey Herzog. Stewart called the Dodgers clubhouse after the game to congratulate Valenzuela. The no-hitter evened Valenzuela’s season record at 6-6 and lowered his ERA from 4.09 to 3.73. A week later, Herzog resigned, saying he was embarrassed by the play of his team.